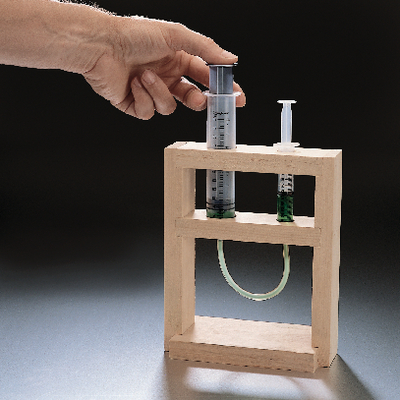 Science teacher Dave Budnik developed a demonstrator to assist in teaching Pascal’s Law and its most universal application: the hydraulic press. By alternately applying force on a large and small piston, students experience the mechanical advantage of one over the other. Teachers can use this clever device when they discuss the many uses of hydraulics such as power steering, hydraulic jacks, shock absorbers, and auto-braking systems. It's designed for grades eight to 12 and includes instructions.